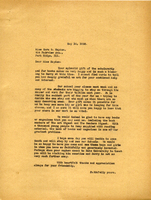 A letter to Martha Berry regarding the payment of tuition for work Eloise Stevens did. Letter thanking Miss Hayden for her donation of money and books for the school, and she goes on to describe the hard process of choosing which students may stay and work on campus in order to save up for the next year's tuition. Letter asking for $150 so a young persona can go to Berry for a year, with corrected address. 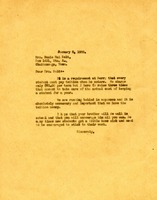 Letter written to request the necessary tuition money from the sister of a student at the Berry School. 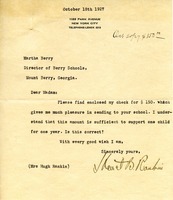 Letter written to Martha Berry from Mrs. Hugh Rankin to inform her of the enclosed $150 check sent to pay for a student's tuition. 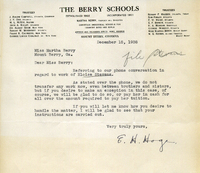 A letter asking for donations of $150 to pay for a student to attend the Berry Schools for a year. Person writes back that he is already giving to the Ozark Mountain School.